From manual cleaning to Alfa Laval Gamajet’s rotary impingement: a big difference! A facility in San Francisco, CA was utilizing manual cleaning to its fullest extent. The company manufactures a wide range of products and was experiencing revenue loss due to their inefficient tank cleaning procedures, and they were under significant pressure to provide a more validatable clean and eliminate confined space entry. Their process included jacketed tanks with dual agitators and the products were burnt onto the tanks. Their cleaning process included 2 hours of manual cleaning every day. The manual cleaning included confined space entry, scraping and scrubbing, and a significant amount of tank downtime and water usage. The tank downtime was 2,920 hours per year and the water usage was 3,504,000 gallons per year which was costing them a total of $16,293 per year. The solution included two Alfa Laval GJ PF rotary impingement tank-cleaning devices. These machines were operating at 90 PSI and 40 GPM per machine. Cleaning included a 5 minutes pre rinse, 10 minute recirculated wash and a final 5-minute rinse. Total cleaning time per tank was 20 minutes. The Alfa Laval GJ PF was able to give this facility a repeatable and reliable pattern that satisfied the quality assurance manager, and it resulted in the elimination of confined space entry, meeting OSHA requirements. This facility was able to save 2,434 hours total in tank downtime per year and was also able to lower the usage of water to 2,336,000 gallons per year saving them $10,862 per year. 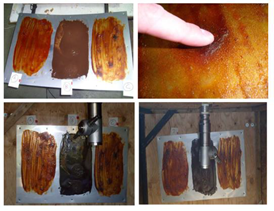 1.1 Baked on products, on a stainless steel plate, placed 5’ from the impingement cleaner. 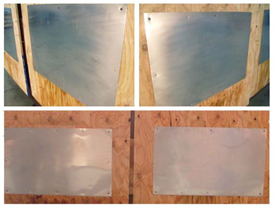 1.2 Stainless steel plates after one half cycle at exact operating conditions.